Today's my birthday(plus a british holiday "Guy Fawkes Night" with the rhyme Remember, remember the 5th of November- by the way that Line was also used at the beginning of the movie V for Vendetta with Natalie Portman) and I wanted to show you my last NOTD, a Konadicure. 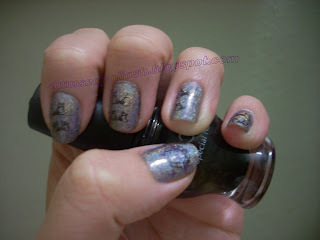 I love holographic polishes so I chose China Glaze's Let's do it in 3D from the Kaleidoskope Collection. The formula on these couldn't be better: it dried fast and was opaque in 2 coats. I let the pictures speak for itself. I used Konad's image plate M3 and M14. 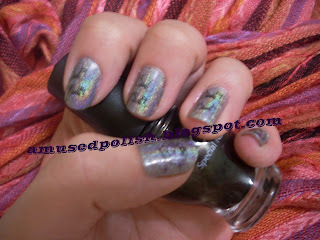 OooO, I love holos and it looks great on you. Pretty scarf too!!! Also - Happy birthday!!!! I hope you enjoyed your day!!! Happy Birthday! That is a super cute mani!